Thanks, everybody, for joining us for what’s going to be a terrific card with Adrien Broner versus Mikey Garcia in the main event at a 12-round junior welterweight fight on SHOWTIME on July 29th, 9:00 pm, Eastern Time, 6:00 pm, Pacific Time, at the Barclays Center in Brooklyn, New York, the home of Brooklyn boxing and presented by Premier Boxing Champions. It’s going to be a terrific card. It’s being promoted by Mayweather Promotions and my company. I want to shout out to Leonard Ellerbe and Floyd Mayweather and all their staff who are working with us on this card. As you all know that they’ve been pretty busy lately. I’m not sure if Leonard is going to join us during this call but if he does, I’ll throw it over to him when he does. Tickets can be purchased at ticketmaster.com, barclayscenter.com or by calling 1-800-745-3000. And there have been some adjustments to the ticket pricing with respect to locations that are fan friendly. So if people go on Ticketmaster now, you will see some adjustments that I think, you know, fans will like when they’re purchasing their tickets. We’re going to start with the opening. First of all, there’s a terrific off-TV undercard today, a terrific card involving Rau’shee Warren was added to the card. Jarrell Miller is fighting Gerald Washington on the card. Katie Taylor from Ireland is on the card, Noel Murphy, Richardson Hitchins, a bunch of great local talented. It’s a terrific card from top to bottom. The opening TV fight features one of the up-and-coming young stars in boxing. He’s already been a world champion at 154 pounds, the IBF 54-pound champion. He made three title defenses against Julian Williams, Austin Trout and Wilky Campfort. He’s now the number two ranked middleweight in the world by the WBC, trained by Ronnie Shields, one of the best young fighters in the world. This will be his New York debut, Jermall Charlo. And Jermall will be fighting Sebastian Heiland, the number one ranked middleweight by the WBC from Buenos Aires, Argentina. This is also his New York debut and he’s fighting in the US for only the second time. He holds a knockout win against former world title challenger Matthew Macklin. He’s the former WBC Latino and WBC International Middleweight Champ titlist. So I’m going to throw it over to Sebastian Heiland and his translator. Could Sebastian Heiland say a few words? Well, first of all, thank you for this opportunity to the DiBella and Mayweather Promotions, Al Haymon and everything and SHOWTIME. Well, I’m ready. I know it’s going to be a battle. But I’m here and ready for it. And now with a record of 25 and 0 with 19 KOs out of Houston, Texas, Jermall Charlo. Thanks, everybody, for having me. As I debut in New York, I’m ready to steal the show and put on a great show. I know he came here all the way from his hometown to shut my career down and everything that I’ve worked hard with, so I’m prepared for everything he has to offer. And it’s going to be a great show. It’s going to be a great night of boxing. I was wondering when you decided to go up in weight, was it strictly a matter of struggling over the last maybe couple of fights to make the 154-pound weight limit or did you just feel that there might be better opportunities at 160? I felt I did everything at that time to be the best at 154 pounds with my twin brother having the belt, Erislandy Lara having the belt, it was better opportunity at 160. What do you see as your path to one of those world title belts and how you can put yourself up in that level of name recognition with some of those other big stars in that weight class? I have to do what I did in 154 pounds or they’re not going to think I’m real. So my job is to fight as hard as I can and train as hard as I can and fulfill my dream and it’s becoming the two-time world two division world champion. Is there anything on Heiland’s record that gives you pause at all? Yes. He’s seasoned. I mean, he’s a fighter that’s know he’s doing and he knows what he came here for. He’s been fighting since 2007. So he’s from Argentina and it’s not like it is in America. So he has to take the same route and he made it this far to be the – for two years in a row being the number one WBC fighter. I’m not taking him lightly at all. Jermall, can you tell us what you think Heiland does well and some of the things maybe you need to guard against in the fight? I mean, Heiland, he’s a good fighter. He’s strong. He comes to fight every time he comes to fight and that’s what I do know about him. Jermall, obviously, if you win this fight, you’re going to be the mandatory in the WBC. Do you feel like the winner of the Alvarez-Golovkin fight could be the next fight for you, if you win this fight? I’m thinking one fight at a time. I’ll get with my team after the fight is over and we will map out everything from that point on. Also a question for Heiland. Can you ask him what it feels like for him to come to this country obviously as a big underdog against Jermall Charlo, what it means to him to come here and also, maybe the odds he’s facing coming in to this fight as an underdog? I know Charlo is a great fighter. But I don’t feel like the underdog because I have confidence in my job. I have my experience and I train. I have great training camp back home. And as I said before, I came here prepared for a battle and I am on a course to be the winner. So if you guys consider me the underdog, I really don’t care. Can you ask him also what it would mean for him in his life, if he was able to win this fight because he’d obviously get a title shot from there? You know, during those two years that I was seeded in the number one in WBC ranking, I went through a lot of things, really a lot of things. But I never quit. I never stopped training. So obviously for me, this is a crucial point of my career and my personal life. So obviously, it would be very important to beat a guy of the magnitude of Charlo at his home backyard. Give me your scouting report on Danny Jacobs’ performance against Golovkin and what you think that says about your championship, your power, your rank and your overall boxing career. I’m at the top of my game right now. I’m actually more focused on beating Heiland than I’ve probably been even in fighting Trout. I thank Trout for the kind words saying I’m better than Canelo. He put up a great fight against me. But moving forward at 160 pounds, I feel like this where I should have been the whole time. So now the pressure is on me to look good and perform good at my highest performance and get the fans what they need to see, so I can continue to reign. GGG and Danny Jacobs was a great fight. You know, Jacobs showed a lot of heart. He exploded. My focus right now is moving on to the next level. My main focus is to get to the next level and all the pressure is on me to perform at my highest level that I’ve ever performed at right now. So I’m not necessarily focused on the winner out of the champions right now. I’m focused on becoming the number one fighter where they have to avoid me. Do you expect your power to translate immediately to this weight class? Knockout power is something that’s God-given. I think my power will translate immediately, like you said. Not only that, I’m feeling a lot better. As you know, making to 154 pounds was the objective and it was the goal all along. But now, my focus has been on sharpening up me and sharpening up my mind. And now that I put my physical strength with my sharper mind, I feel like I’m going to fight a lot better. The main event on this show is a sensational matchup between Adrien Broner and Mikey Garcia. Mikey is undefeated, 36 and 0. Adrien is 33 and 2. But Adrien is undefeated at 140 pounds which is the weight for this fight. This is a fight that really is a fight between two stars to fight between two guys whose names come up in pound for pound kind of discussions. Mikey Garcia, the 36 and 0, with 30 KOs has knocked out 19 of his last 21 opponents. He won the BC Lightweight Title on his last bout on January 28 with a third round KO of undefeated Dejan Zlaticanin to become a three-division world champion. He’s held titles at featherweight, super featherweight and lightweight and he’s never fought above 138. So this is his first fight at 140 and he’s taking on one of the very best. So, Mikey, would you like to say a few words, please? Yes. Well, you know, we’re finishing up camp over here. I’m very excited, very happy for the fight. You know, we’re just a little over a week to go and I think it’s going to be one hell of a fight. I think we’re going to be very excited to see, you know, it is any challenge like you mentioned I’m fighting 140 pounds for the first time especially against, you know, former world champion in Adrien Broner. So I think it’s going to be another opportunity for me to show the fight fans and all of the media what I’m capable of doing. Okay. I’d like to thank everyone for joining the call today. We’re really excited about this great event we have next week. I think it’s going to be a very, very exciting fight. Most of the media are favoring Mikey Garcia to win the fight. I feel differently. I think that Adrien is coming to win the fight. I think he’s going to put on an excellent performance. And this is the new Adrien we’ve heard different things in the past on Adrien and I think this is the defining fight in his career that’s going to take him to the next level, to the superstar level where he belongs. So without further ado, here is Adrien Broner. I’m ready to fight. And next week I’m going to show everybody and I’m still that young and dangerous. I’ll go take over this sport of boxing. So I’m ready to answer my questions and get off this phone. How much has it motivated you and really driven you that you’re the underdog during this camp as you get ready for this fight? I really don’t look at that because I know that time next week it won’t be what it was. But, you know, I just want to go out there and show the people, I am one of the top boxers for a reason. I’m going to be victorious next week. How much does it help you to go out to Colorado Springs that you made a point of saying that you really thought that was going to make a difference for you in the camp? How was it translated to helping you better prepare for the fight? I feel great. Man, you know, I weighed in at 144 this morning. I can make weight tomorrow but I wanted to go down. I’m just ready to put on a show. Has it been easier for you to get down to around 140 than you thought or about what you expected? I’s actually easy, man. Now I got a reason to make 140. But I ain’t giving nobody half of 1 million dollars. I mean, I’ll probably give somebody $10. I ain’t going to give nobody half of 1 million and nothing. Mikey, what is camp like for you, has it been easier because you’re weighing in at a higher weight? Has that helped you at all? The camp has been great. As far as the weight, that’s never been a problem and it’s just training hard, you know, getting in shape. That’s the number one thing. The weight is not actually – it’s not a problem. So I know I ain’t worried about the weight. We just actually are eating a little bit more than usual to keep the weight higher because I would have dropped weight too soon and we’re sparring big guys and we don’t want to do that. You know, it’s not the correct thing to do. So I just feel very comfortable right now. Hey, my question for you, first of all, did I hear you say if the penalty for you not making weight or you’re not making weight was $500,000? Is that correct? Okay. So that’s a pretty big motivation, I would imagine, to get down to the 140 limit. Is that how you’re looking at it? I ain’t giving nobody nothing. Do you look at this as a defining fight against Mikey Garcia even though it’s not for a world title? Yes. He’s another star in boxing and he’s undefeated. Of course, it’s a hell of a fight for me and it’s definitely going to be a defining moment for Adrien Broner. Do you think that this would be even more significant than any of your world title victories? I mean, you can say that but at the end of the day, man, I fought a lot of good fighters then but, I’m just worried about getting my victory, man. I can say the fact but I ain’t trying to get in all that right now. I’m more focused and ready to fight. Do you think that Broner, because of the recognition of his name and the fact that he’s a very, very well-known fighter who has fought some big names also, that it would be almost a bigger win for you in this fight that when you won your world titles? Well, he’s the most accomplished fighter, four division world champion. And like you said, more recognized name. So that makes it a bigger deal. Fans and the media are more excited about my fight with Adrien Broner, you know, than some of the other world title fights around the category. This fight is much bigger still than some of the world title fights that me and Adrien have been part of and some of the title fights that are around the division. So it is a very big and fun fight and it could definitely easily be seen as probably the biggest fight of both of our careers for Adrien and myself. But, you know, I’m not looking at that. I’m not letting that distract me from my task at hand which is defeat Adrien Broner. Mikey, do you think the fact that this is not for world title matters at all to anybody? No, everybody is excited for the fight. I mean, I got nothing but, you know, good reviews and good comments, you know, and everybody is so excited about, you know, this fight coming up. Like I said, it seems like it’s bigger than some of the other title fights that are happening around the weight class and, you know, it just shows you the kind of fighter that Adrien Broner is. He has a lot of, you know, fans and he’s a high-profile fighter and people see me as a high-profile fighter and when two guys, you know, like us get in the ring, you know, make sure it’s a great match up. Hey, Adrien, could you address that briefly? Your thoughts about the magnitude of the fight? It’s a good fight for boxing. You got two fighters who were both on Pound-for-Pound at one point at a time. You know, I’m a four-time world champion. He’s a three-time world champion in three weight classes. I’m a four-time world champion of four different weight classes. This is a big fight for boxing. And if you’re a boxer, it’s going to be a hell of a fight, July 29. Have you given thought to whatever happens, whether you’d like to stay in this weight class or would you still like at some point to defend your title on lightweight? No, I still have plans on coming down to 135 to unify the titles or have a big title, defend the lightweight. But, you know, after being in boxing so long and learning the policies on the business about it, you got to be flexible. You got to be able to adjust and make those adjustments and continue with my career. I’m not going to sit around, wait for a fight, you know, and chase anybody. I’m here to, you know, take on the biggest fights available, the biggest challenge available, whether that means at 135 or at 140 or possibly even 147. Hey, Lou, can you answer one question for me? I’m interested in your opinion about what Mikey and Adrien were talking about. You know what, in this kind of case, I don’t think the title matters. And you know what, I actually like the fight, too. They’re fighting at 140. They’re fighting at a legit weight class. It’s not like some strange catch weight situation. They’re fighting at 140 which frankly is pretty much, I mean, for a guy who’s a 135-pound champion, the highest you would expect Mikey to go for a challenge. And it’s the best weight Adrien for that in his career. I mean he’s undefeated at 40 and 47 frankly is not his best weight. So, I don’t think the weight matters. I think the weight here is sort of optimal to see a great fight. And I don’t think anyone cares. So I think this is a great fight. Personally, I think this is bigger than your average title fight. Against a counterpuncher, a good defensive fighter like Adrien, how much does your style have to change? Do you have to maybe be less aggressive than you would normally be? You know what, we have been working on a lot of things (over time), working on different game plans, different style of sparring partners so I can be ready for whatever Adrien Broner brings on Saturday night. You know, if I have to be aggressive, I will be aggressive. If I have to maybe box, I will box. If I have to try to stay in the middle of the ring, then I’m prepared to do whatever it takes to win this fight. And like I said, I still – I know people still haven’t seen everything that I have to offer and I think Adrien Broner will be the one to challenge me enough and push me to that next level and bring out the best out of me. The world keeps hearing about the all new “About Billions.” Again, what’s that in detail? Everybody keeps saying “About Billions.” But now it’s “About Boxing.” So as you can tell I left the “About Billions” lifestyle, I left it alone for this whole camp. And that’s why the new series that I’ve been putting out is about boxing, becoming “About Boxing.” So, you know, my main focus is just getting in the best shape I can so I can go mess Mikey up. And that’s it. You know, it’s nothing personal. If I hurt him, I know he’s definitely trying to come hurt me, but I’m coming to mess him up. I’ve said like we’re too close right now and I feel like punching his face. What’s your take on “About Billions” becoming about boxing and how are you trying to stop that whole movement? Oh that’s great, because that just means it’s going to be a better fight. I don’t want to have a fight against unfocused, untrained, out of shape Adrien Broner. That takes away all the credit. And, he seems to be ready to get in the ring now and I love that because at the press conference he was being a little too friendly. And we’re not friends. We’re definitely not friends on Saturday night, 29th. So that’s exactly the Adrien Broner I want to hear. First of all, can you discuss breaking your hand in the first round against Adrian Granados? And how difficult was that to overcome? Would you rank that as the most adversity that you perhaps have had to overcome in the ring? No. My worst adversity was I actually broke both of my hands when I fought this kid named Lugo. And I think it was on the Pacquiao-Oscar fight. I broke both of my hands in that fight. And fighting since from that fight, that was probably the worst for me. It was tough though but, I had to do it. I’m in a bigger fight, bigger cash and I’m just ready to put on a show. I’m just ready to let the world see me. It’s not an issue whether I do it on 140 pounds now. I’m in top shape and I hope he’d be into top shape. But I’m ready to let my hands go at that time on July 29th. No way in hell he a better boxer than me. Who he beat? I don’t know. Listen, man, I can’t tell the future. But I know I’m going to beat him. Can you characterize what you mean in regard to your new demeanor? It’s time to take boxing more seriously. When you touched the type of money I’ve touched at a young age, man, you don’t know how to handle it. Like I said before, I’m older. I got experience in life. I know what I want to do and that’s be the best Adrien Broner I can be. 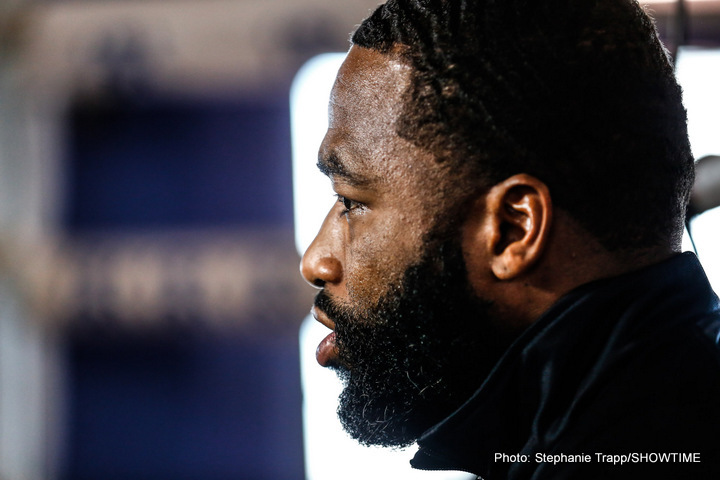 Can you talk about why you think you’re the better boxer than Adrien Broner? Well, I’m going to show it on Saturday, the 29th. I’m going to show my skills. I’m going to show what I’m capable of doing. Like I said, before, I haven’t had a challenger, you know, really push me to the next level. And I think Adrien Broner will do that. And I’ll be able to show everybody, you know, another set of Mikey Garcia you still haven’t seen. How does he rank among your opponents? I think he will be the toughest challenge, the toughest opponent, the most accomplished fighter, that I have faced. So, honestly, I think it will be the toughest fight of my career so far. Question is can you talk about the underdog situation? I really don’t feel that it’s fair to rate you that low as far as your skills. Can you talk about that a little bit? I don’t care about being the underdog because at the end of the day, man, I don’t make no money off of that. They’re just – there’re some gambling people, man. There’re some people in Vegas, man. It’s okay though. I bet they won’t do it again after this fight. Do you think that a win next week would make both of you guys pay-per-view fighters? I mean, you could put me on pay-per-view now. To be honest. But, this of course, it’s going to help take me to the next level. But, you know, I’m not worrying about that. I know all I got to do is be sharp and get this victory and do what I do and pay-per-view is going to come. Well, I think if you take the right matchup you can take it to the pay-per-view. I mean, this fight itself could have been a pay-per-view possibly. And when you got two exciting fighters with a lot of fans on both sides, that makes pay-per-view. Now a win over Broner might help me get to that level faster but, you know, it’s just – you got to have the right guy. I mean, if I beat Broner, but then my next fight is against a nobody, there’s no way that can be a pay-per-view fight. You have to be able to fight the right guy that can generate the buzz and make it a pay-per-view show. You know, pay-per-view is not necessarily the Holy Grail even if you’re a big fighter, as was proven when you just saw a pay-per-view fight between Kovalev and Ward that about 125,000 people bought. So far more people are going to see this fight. You can go back to Golovkin-Lemieux and a lot of other things. I’m not blaming the fighters but for people to dip into their pockets in an economy that’s difficult and dish out $70 regularly, you need the right event. A fight like this is a great fight. It’s on SHOWTIME, which it should be accessible to many more people. And frankly you can get more from half a year of SHOWTIME for the price of one pay-per-view. Mikey, I was just wondering, who was the biggest puncher you fought so far and can you tell us why that is? I’ve been faced with some guys that are supposed to be heavy punchers, but I haven’t felt their power. I have the right game plan and didn’t really feel it. Dejan was supposed to be a big power puncher; I didn’t feel it. Salido is a heavy hitter. He has become champion even after I beat him. He still became champion several times and beat some tough guys. And I didn’t feel his power. Some of the guys earlier in my career, not any known names. But I think Adrien Broner is the guy that probably hits the hardest out of everybody especially because we’re moving up in weight. He is a bigger man naturally than me as far as weight. So we’ll find out Saturday night, the 29th.